Bradshaw’s is a local family owned and operated business established in 1938. Over the years we have helped out our neighbors and community with fund raisers, non-profit organizations, and police officers injured on the job. We also offer a discount to all active duty military and veterans. Below is just a few things of how we have helped out our neighbors and community. Pictured: Shanon Greisen, Vice President of Bradshaw’s Auto Repair and Bo Bullock, Operations Manager of Schoolhouse Supplies. Bradshaw’s Auto and Fred Meyers team up to help Schoolhouse Supplies. 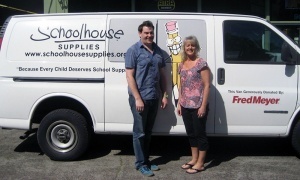 Schoolhouse Supplies is an award-winning nonprofit that supports public education in Portland by giving students and teachers free classroom supplies. Schoolhouse mission is to serve classrooms in need by operating a volunteer-run Free Store for Teachers, which is stocked with supplies donated by the community,” is based on the belief that every child deserves school supplies and has the right to a quality education regardless of circumstance. Schoolhouse Supplies operates Oregon’s first and only volunteer-run Free Store for Teachers to provide teachers with the classroom supplies needed to encourage the learning process for all students, and the Tools for Schools backpack program to support the highest-need school communities in Portland. Today, we are a nationally recognized leader in the Free Store movement, which creates direct links between students and members of the community. When the word got out that their GMC van needed a rebuilt transmission, Bradshaw’s Transmission Annex and Fred Meyer joined forces and together got them back on the road. After serving as the popular and handsome spokesman for the sheriff, Coates responded to a report of a domestic disturbance call. He was shot in the face by a 15-year-old. Coates survived the shooting but the wound eventually forced him to retire. Since then, he has become a fixture at classic car events, including the Portland Roadster Show. He had purchased a 1972 Nova just before the shooting. Friends and car enthusiasts came together to restore the car. Locally owned Bradshaw’s Transmission and PTW teamed up to convert Damon Coates 1972 Nova from a manual transmission to an automatic transmission. 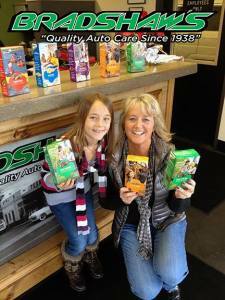 Bradshaw’s Service Center teams up with Local Girl Scout’s to help raise funds for their summer camp. For a limited time Bradshaw’s will be giving away a box of your favorite Girl Scout Cookies with any repair.